In this podcast you will learn: How to develop intuition – Know the Characteristics of Intuition, Actively work on Developing it, Get results you can validate, and Learn the common characteristics of intuition – symbols, pictures or part of a picture, no language, maybe a word or two, feelings. Jason Hawes & JV Johnson welcome guest Lisa K., PhD to talk about her work in studying and mastering intuition. Lisa offers an explanation of how and why we have intuition and she offers guidance on how we can better develop and better use it to improve our lives. When was the last time you had a strong gut feeling about something, or that little voice inside was whispering in your ear? How would you like to access that intuition on demand? I recently had the pleasure of interviewing author Lisa K about her new book. In our interview together Lisa provides easy to use techniques that when practiced will allow you to access your intuition more frequently and with greater levels of reliability. Ever wished for your intuition to kick in when you wanted it to, or use it for what you want rather than have it happen randomly? Maybe you want to get more detailed and clear information from your intuition? Or you find it hard to trust your intuition because you think you might be making it all up? 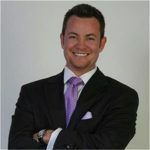 Guest on The Dr. Pat Show: Talk Radio to Thrive By! For most people intuition is random and elusive – we get a gut feeling about something or someone but we’re often not sure whether to trust it. Sometimes we act on those intuitive senses and sometimes we regret not having ‘listened’ when we should have. What if there was a way to recognize, harness and refine those gut feelings, that we often call our sixth sense, so that we can improve our decision-making and our lives? Our greatest challenges and opportunities for soul growth come in the areas of relationships, career, money and health. 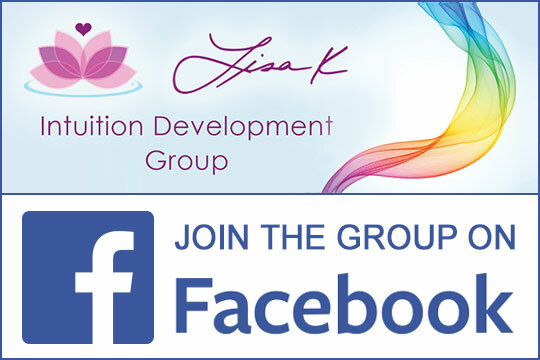 If you would like to access tools to help inform and guide you in these areas, Dr. Lisa K. reveals wisdom and empowering techniques to support you in relaxing more into your authentic power and sense of safety in the world. Did you ever have a “gut feeling” about something that resulted in your changing your plans or actions? In a conversation with someone, did you ever hear an inner voice tell you not to trust that person or that the person was being completely honest. Have you ever felt an attraction to a person, place or thing and was not sure why. Every one of us has experienced these intuitive flashes, sometimes acting upon them and sometimes not. What if there was a way that you could not only develop your intuition but learn to trust it personally and even professionally? 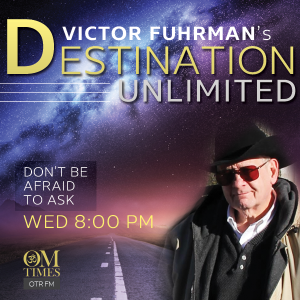 My guest this week on Destination Unlimited, Lisa K., says there is a way! Create the personal and professional life you’ve always desired with practical tools and inspiration with Sue Lundquist and her expert guests. Juicy stuff happening on the Radio today. We are talking intuition however this is going to be more linear conversation…Lisa K holds degrees in Electrical Engineering, PsychoBiology from the State of New York and PhD from Metaphysical Sciences. Guest on Joy Barker’s Angel Talk Cafe – Lisa K. (Intuition Expert), joins Joy in the Café to discuss her new Book “Intuition On Demand”. 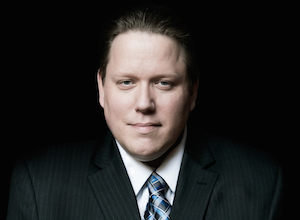 Intuition On Demand provides a step-by-step technique that is a down to earth, tangible process that makes sense to people. 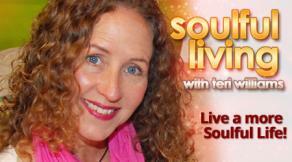 Guest on Soulful Living with Terri Williams -If you have ever wondered about your intuitive abilities, this episode is for you. Lisa K. offers a few ways to help find, develop and fine tune your intuition into one of the most powerful tools for life. 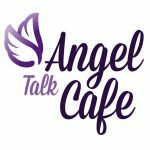 Guest on Angel Talk Cafe – Joining Joy and Dan today is Lisa K., creator of the Developing Your Intuition system and co-author of Grow Your Spiritual Business. Once a successful executive for Fortune 500 companies in the United States and Asia, Lisa teaches spiritual entrepreneurs how to improve their businesses with a variety of simple but proven strategies. 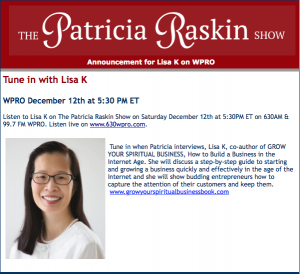 Tune in when Patricia interviews, Lisa K., co-author of Grow Your Spiritual Business, How to Build a Business in the Internet Age. She will discuss a step-by-step guide to starting and growing a business quickly and effectively in the age of the Internet and she will show budding entrepreneurs how to capture the attention of their customers and keep them. “Shine On: Kacey’s Health and Happiness Show” is about finding balance in your life, improving your health, helping your family,building your dreams, and giving to your community. The show airs Sunday mornings at 6:30 am on 100.7 WHUD.